2) to guarantee an optimal therapy for the patients. ESP has prepared a programme to support education in highly specialised areas. This advanced training program should help young pathologist to get in-depth experience in selected training centres throughout Europe. A fellowship, named after Professor Alfonso Giordano who initiated the foundation of the ESP, will be offered to young pathologists to support this programme. 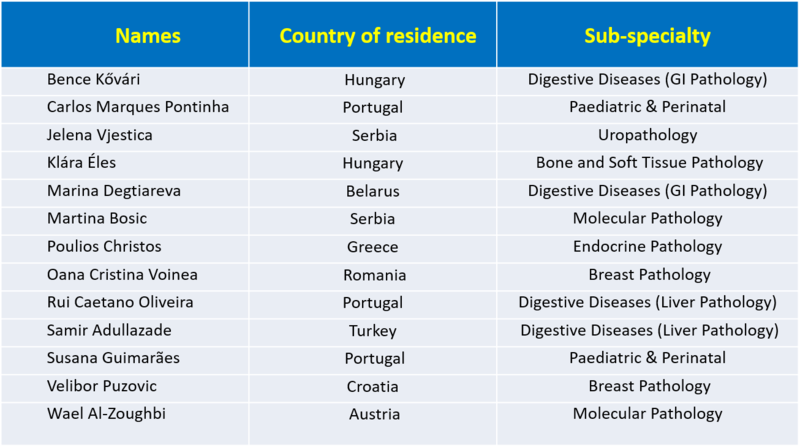 Selected areas of GI pathology, lung pathology, etc. Provide trainees with a detailed certificate describing their work after completion of their training. Send the applicant a Letter of invitation. 4) Information about the programme (“Current offer”) and list of selected centres (“Participating Centres”) will be permanently published on the ESP web page (see below). The ESP GF bursary provides financial support for young pathologists and residents in the final year of their specialisation to gain in-depth training in specialised areas of pathology. The scientific programme and the educational activities carried out under ESP GF grants should be ethically sound and of the highest quality and fall within the ESP scientific scope. The annual closing date for GF grant applications will be 16.00 (4PM) CET, 15 June. Funding requests must be submitted the year prior to the start of the activity*. The application review timeline is 10 to 12 weeks. 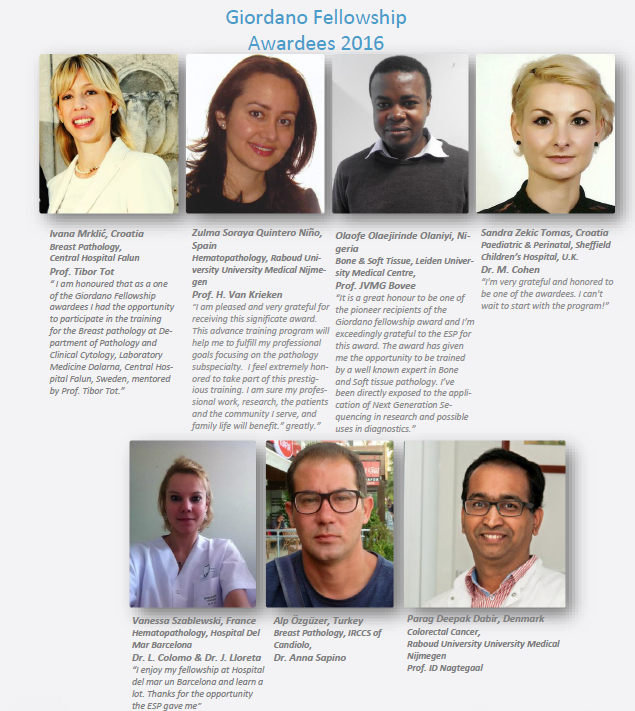 The names of the awarded Giordano Fellows will be announced each year during the annual European Congress of Pathology (ECP) in September. Written official notifications will be sent to the awardees and the host ESP Advanced Training (EAT) centres following the ECP. *Example: For an application submitted before 15 June 2017, the GF program at the EAT centre should be scheduled for 2018. Applications should be submitted by email to the Director General of the ESP (Dr. R. Al Dieri) at r.aldieri@esp-pathology.org with the subject “Giordano Fellowship”. Bursary-holders are expected to develop a personalised scientific and educational programme in close collaboration with the host EAT centre. Whilst there will be room for flexibility in planning and conducting the GF activities, major changes from the programme initially submitted will require prior approval of ESP. The ESP will finance each Giordano Fellow up to a maximum of € 1500 per month, including travel expenses, for a maximum of three months. ESP reserves the right to decide the amount of funding individually, taking into consideration the country of origin of the successful applicant, the location of the EAT Centre (i.e. the cost of living**) and the individual’s regular income. Each year the ESP announces how many GF applications might be funded for the forthcoming year. 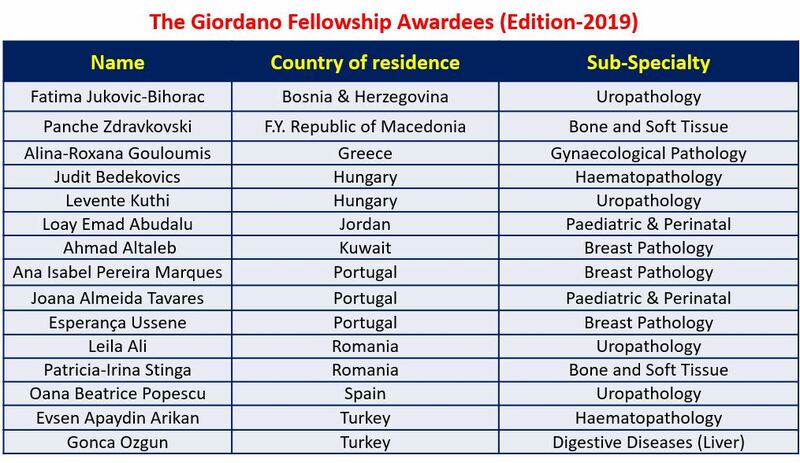 Giordano Fellows are not eligible to re-apply for GF. It is possible to complete a stay at one of the EAT centres also without requesting financial support from ESP (i.e. without being awarded by the GF bursary). In this case, the same eligibility rules apply for applicants, but there is no need to send an income certificate. ** If the EAT centre can provide accommodation at a reasonable cost in a student home or guest room, and/or there is an opportunity to pay a reasonable price for meals in the host institution’s dining areas, please make it clear in the application. ESP members are encouraged to apply for the GF program. Potential applicants should contact ESP in advance of the submission deadline if they have any doubts concerning their eligibility to apply for a GF grant from ESP. Have been a member of the ESP for at least three consecutive years. Exceptions from the above-mentioned criteria are possible, this will be marked in the checklist and the committee will consider it. One year after completion of the fellowship, the Giordano Fellow is required to submit a progress report to the ESP HQ. It is the responsibility of the Giordano Fellow to write the narrative, describing his/her progress, how the gained knowledge has been used and disseminated to colleagues of the home institution (or multiple institutions of the home country of the fellow). All above listed documents will be checked by the office of the ESP. If anything is missing, the applicant will be requested to supply additional materials. The committee is chaired by a Coordinator selected by the president of the ESP from the members of the committee (usually the ESP Council member). The Evaluation Committee members reply at the latest two weeks after receiving the documents. The ESP office is in charge of receiving and compiling the responses from the Evaluation Committee members. A response from at least five out of seven Evaluation Committee members is required to make a decision. Based on summary of the responses from all Evaluation Committee members, a final decision is taken about granting the Giordano Fellowship and the final financial sum to be provided to each applicant. In borderline cases, the Coordinator of the Evaluation Committee makes the final decision. The Evaluation Committee retains the right to accept or reject an application. If an application is rejected, a short explanation will be sent to the applicant (e.g. due to financial reason, due to reaching the yearly limit of the number of fellowships, due to professional weakness, etc.). Finally, if the number of applications advocated by the Evaluation Committees exceeds the number of positions in any given year, ESP officers (President, Treasurer, Coordinator and ESP Director General) will determine the final list of grantees. GF applications are provided to ESP in confidence. ESP will not use the information contained in the application for any purpose except the purpose of reviewing the GF application and monitoring it, if it is funded. ESP may disclose the application to its employees and reviewers. ESP will not otherwise disclose the information unless it is funded.